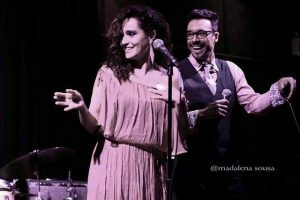 Brazilian Music Soul is a New York-based fresh, soulful band with two lead singers Vanessa Falabella & Carlos Dias. Brazilian Music Soul is Vanessa Falabella, Vocals and Light Percussion, Carlos Dias, Vocals, Guitar and Berimbau, Richard Miller, Guitar, Greg Jones, Bass, and Graciliano Zambonin, Drums. Catch this fantastic group at Jazz Forum on Sunday, Jan. 21 at 4 & 6 pm!